A call for unity is something very laudable. That is precisely what we issued over a week ago, when board members of the Women of the Wall were still scoffing at us, saying that our press releases would be ignored and no one would care about what we do. At the time, we announced that we would be at the Kotel — just praying. That is our goal and has always been our goal — that the Kotel should remain a place of unity, where all Jews feel comfortable praying, where there are no divisions of “us” vs “them,” where we can all pour out our hearts to God. Unity is found in respecting the Jewish traditions we women have preserved for millenia. Once you realized that we could not be ignored, you announced to the media that you are “anticipating provocations by ultra-Orthodox individuals and groups.” We are not ultra-Orthodox; we cross the religious spectrum. We are non-observant, traditional, dati-leumi and chareidi, Ashkenazi and Sephardi, Chabad, Chassidic, Lithuanian, and more. In the end, we are just Jews. And we will be there neither to provoke, nor to respond to your provocations. Nonetheless, we are not coming in response to your invitation, but despite it. 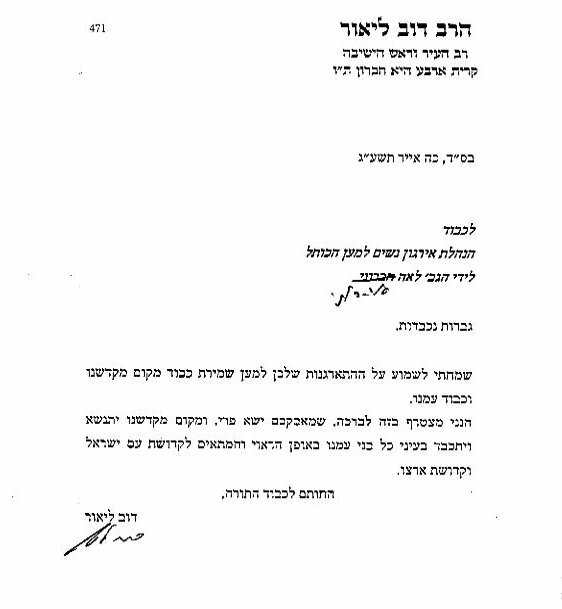 While you now claim that you wish only to pray together, your leading “Mothers” Susan Aronoff and Rivka Haut made it clear just days ago that your intent is to change us, to free us of “rules enforced by a patriarchal system,” to show us that “women can take control of our own religious lives.” You want to “model” how it should be done — you want to be the catalysts, to provoke that change. You write now about “honest intent,” but you have not been honest. You have been engaging in political provocation at a Holy Site, as we have said all along, and that must end. It is clever of you to talk about us as if we were a “fringe group.” It will be obvious tomorrow who represents the majority of Jewish women who care about the sanctity of the Kotel, and who is on the fringe. You have always represented a largely American group, trying to tell us how it should be done in Israel. You want the media to stop coming? Then stop coming as a united group to try to change us. Return to Robinson’s Arch, where you can pray however you like without trying to tell us how we should live our Jewish lives. To claim that we are subjugated, that we are not independent thinkers, that we need your help — that is hatred for our way of life. Stop practicing Sinat Chinam, baseless hatred, and you will find it mysteriously vanishes. It’s easy to have peace and unity — just pray with us, and don’t try to change us. We’ve had control of our religious lives all along, thank you, and we are not buying what you are selling. 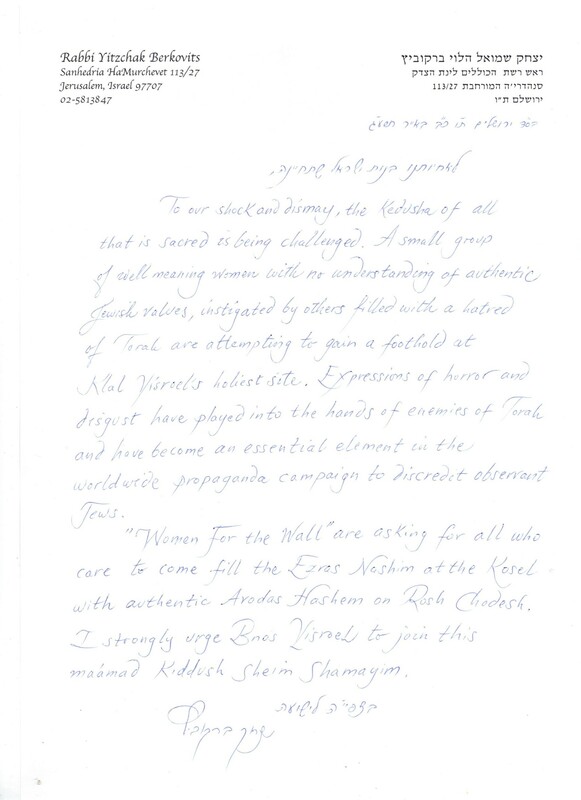 You have indeed provoked us — to gather at the Kotel and declare our fealty to millennia of Jewish tradition. Please join us, and we shall indeed all pray together. The provocations by the ultra-Orthodox individuals and groups (garbage throwing, verbal assault) predate your involvement. And they happened today beyond your control. Counter-protests, despite your wishes, rarely go peacefully.